MIRITELLO, GABRIEL, 78, of Brooksville, died Thursday (July 10, 2003) at Regional Medical Center Bayonet Point. Born in the Bronx, N.Y., he came here in 1987 from New Jersey. 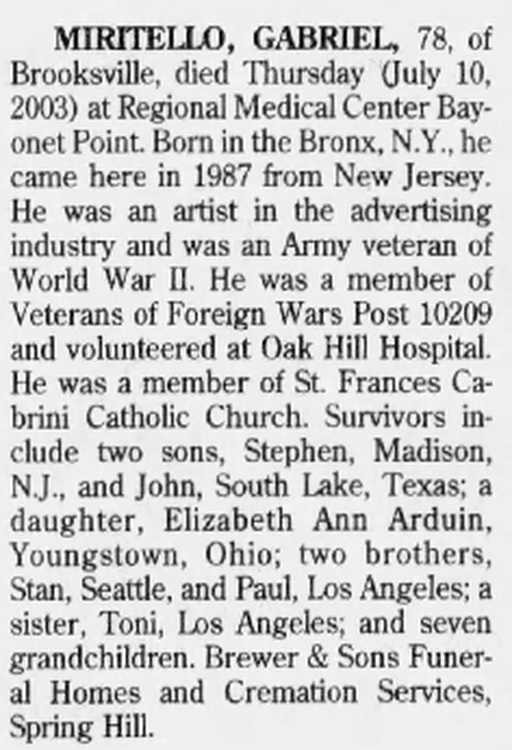 He was an artist in the advertising industry and was an Army veteran of World War II. He was a member of Veterans of Foreign Wars Post 10209 and volunteered at Oak Hill Hospital. He was a member of St. Frances Cabrini Cabrini Catholic Church. Survivors include include two sons, Stephen, Madison, N.J., and John, South Lake, Texas; a daughter, Elizabeth Ann Arduin, Youngstown, Ohio; two brothers, Stan, Seattle, and Paul, Los Angeles; a sister, Toni, Los Angeles; and seven grandchildren. Brewer & Sons Funeral Funeral Homes and Cremation Services, Spring Hill. 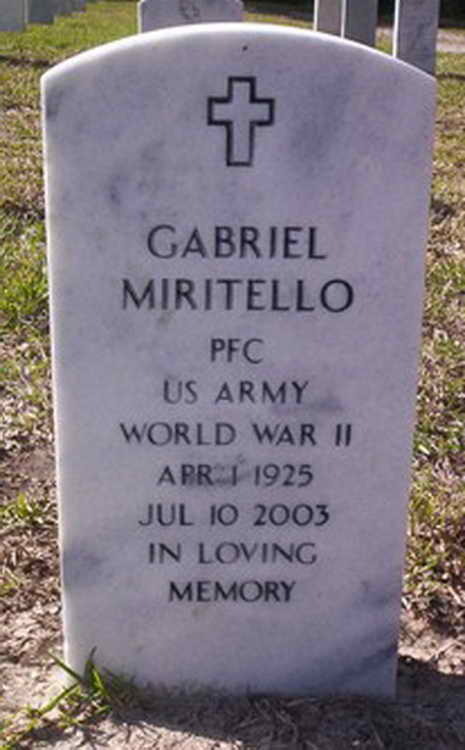 Grave marker for Gabriel Miritello in Section 104, Site 176, Florida National Cemetery, Bushnell (Sumter county), Florida. Gabriel enlisted in the Army at New York City, NY on 9 November 1943. On 10 March 1945, Pfc Miritello was transferred from the 505th PIR to Hq 2nd, 508th PIR.